While blue jewels like Earth are rare in space, many celestial bodies possess subsurface oceans. Such oceans may be heated by internal planetary heat or by interaction with a larger planetary bodiy (tidal heating). In our own planetary system Europa, Enceladus, Ganymede, Ceres and Pluto are possibly harboring such oceans. Given this abundance in our direct neighbourhood, subsurface oceans can be expected to be the most abundant environment offering conditions suitable for life. Subsurface oceans contain several elements essential to life: liquid water, protection from cosmic radiation (given surface ice sheets) and a mix of various mineral elements (given thermal activity of the parent body). The only major thing lacking is energy, at least when focusing on light energy which is driving almost the complete terrestrial biosphere. Some energy may be generated from chemical reactions in subsurface oceans. This source of energy, however, is limited and is predicted to be sufficient only for lower forms of life. There is another form of energy available in subsurface oceans: Given tidal forcing and/or thermal activity of underlying material, there will be strong currents in subsurface oceans. Terrestrial organisms have never learnt to use this kind of energy, since there are abundant alternatives. Our muscles, however, are able to transform chemical energy into mechanical energy. Organisms from subsurface oceans might have developed just the opposite capacity. Here I will explore a subsurface biosphere which has learnt to use the energy stored in waves and currents. Here, for a start, I am showing two typical organisms from the upper layer of a subsurface ocean. There are small worms living from the energy stored in currents and larger animals eating these worms. The small worms are representing part of the basis of the ocean’s food pyramid. By converting mechanical into chemical energy, they are providing food to all other organisms. Since they are floating freely in the oceans, they are part of the plankton. There are, of course, also smaller, microscopic organisms belonging to this plankton. 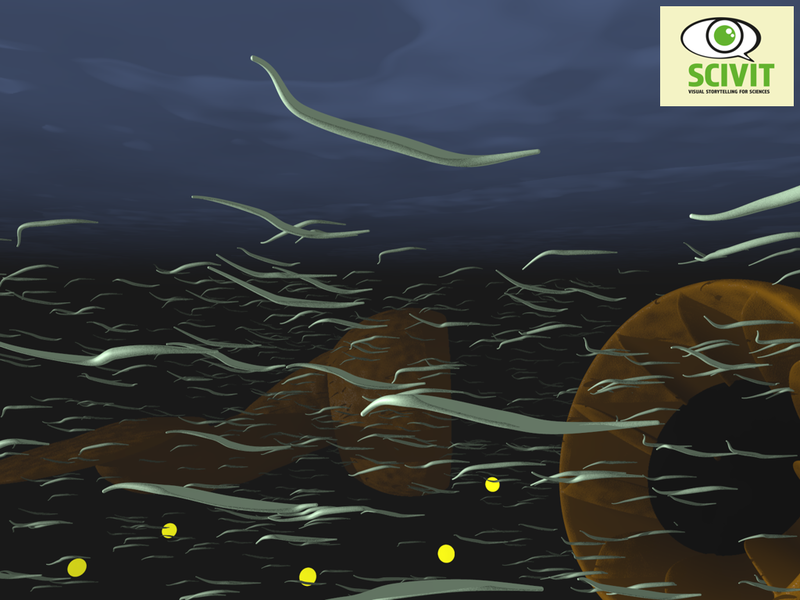 Upper layer of a subsurface ocean with small worms living from current energy (autotrophs) and two larger organisms eating them (primary consumers): Light conditions are not realistic. Except for some bioluminescence (yellow spheres) there should be complete darkness.